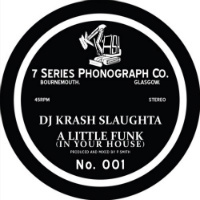 What better way for B-Line Recordings’ new vinyl 45 imprint, 7 Series Phonograph Co., to introduce itself than with two super-funky b-boy bangers courtesy of Glasgow’s DJ Krash Slaughta (previously A.W.O.L. since his Bobby Deans find and remix in 2016) and Bournemouth’s Specifik. Krash brings us A Little Funk (In Your House) which turns on a funky drums and conga break, features a jazzy trumpet motif, a certain ‘A lil funk in your house like that y’all’ vocal cut and tops it all off with more scribble scratches than you can shake a fat marker pen at. Squaring off against it on the flip are the windmilling guitar-led breaks of Specifik’s Back To Business featuring Whirlwind D and Carpetface – though with neither of the latter two behind the mic. Well, not exactly anyway. The voice on those vocal cuts is actually D’s whereas Carpetface is behind some of the additional percussion. It’s all about the drums!